Goalie Jake Oettinger and four 2017 recruits are among 104 draft candidates at the NHL Combine in Buffalo, which began Sunday. Joining Hockey East’s All-Rookie goalie are center Shane Bowers and defensemen David Farrance, Kasper Katkansalo and Cameron Crotty. As a team we fell short of the goals we set and a lot of us, including myself, learned just how hard it is to win championships at the college level. I think it's more motivation this summer for a lot of guys to complete those goals and dreams of winning the Beanpot Tournament, Hockey East, and then winning the NCAA regional and Frozen Four. These are goals that every guy in our locker room has. We'll have to dig deep and remember the feeling of watching Harvard raise the Beanpot or watching the University of Denver win the national title on television when we were in our dorms. We have to use them as motivation to push us next season. Center Shane Bowers of Waterloo in the USHL was asked in a team interview for the name of the bar he went to while on a recent visit to Boston University. Bowers, No. 16 on NHL Central Scouting's final ranking of North American skaters, will play for the Terriers in 2017-18. "I told them I didn't go into any bars," he said. 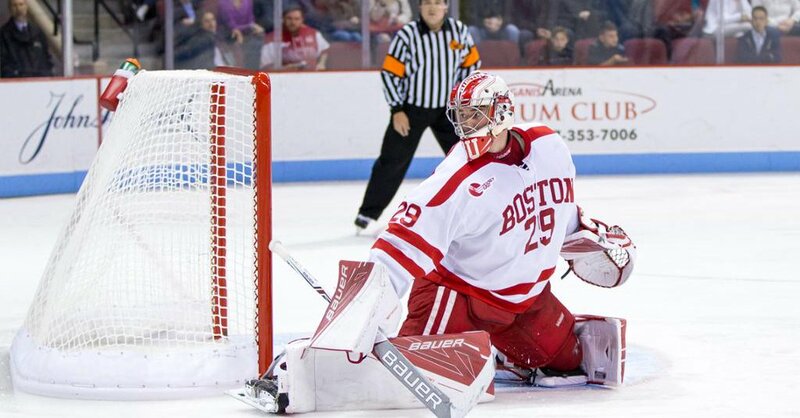 Boston University goaltender Jake Oettinger (6-4, 212), No. 1 in NHL Central Scouting's final ranking of North American goalies, was asked in a team interview what personality trait he felt he possessed that would prevent him from playing in the NHL. "I had to think about it and then told them I didn't think there was a personality trait of mine that would prevent me from playing," Oettinger said. "I think I have all the tools and the work ethic necessary to potentially be a No. 1 in the NHL one day." Nick Bonino scored a pair of goals as the Penguins took Game 1 of the Stanley Cup finals, defeating Nashville, 5-3. The Predators played without Colin Wilson, who is injured. Bonino scored late in the first period and added an empty-netter late in the third. He has four playoff goals. With the Penguins earning a return to the Stanley Cup finals by eliminating Ottawa in a double-overtime seventh-game win, two former BU teammates, Pittsburgh’s Nick Bonino and Nashville’s Colin Wilson, will compete for Lord Stanley’s Cup. On the Terriers’ 2009 national championship squad, Wilson was the team’s top scorer with 55 points followed by Bonino with 50. The BU connections to the Cup Final, which begins on Monday, go beyond the two skaters. Former Terrier captain Mike Sullivan is the Penguins’ head coach; while Paul Fenton is the Predators’ assistant general manager and Jeff Kealty is Nashville’s chief amateur scout. According to reports on the WEEI.com College Blog and in the Boston Globe, freshman Kieffer Bellows has left the Terrier program. A first-round draft pick of the Islanders last June, Bellows scored seven goals and seven assists with 40 penalty minutes in 34 games. The left wing from Edina, Minnesota, who is expected to join the WHL Portland Winterhawks, struggled to find consistency in his game and was a healthy scratch in five games. 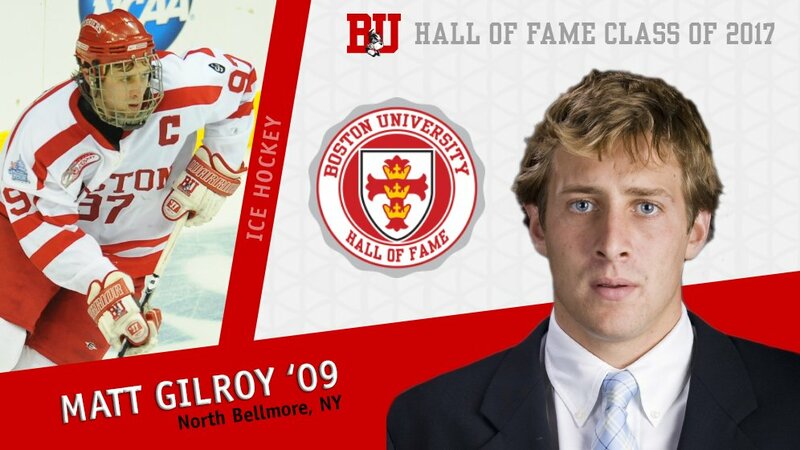 Former Terrier co-captain and Hobey Baker Award winner on the 2009 national title squad Matt Gilroy has been named to the 2017 BU Athletics Hall of Fame class. A walk-on forward who converted to defense, Gilroy would become a three-time All-American and the first defenseman to be named All-Hockey East first team three times. He set up Bonino's game-tying tally (occurring at the 5:04 mark in this video) in the final seconds of regulation against Miami in the 2009 championship game, which BU won in overtime. Now in his second season with Moscow Spartak of the KHL, he previously played in the NHL for the New York Rangers, Ottawa, Tampa Bay and Florida. There are three former Terriers in the AHL Calder Cup semifinals: John McCarthy and Danny O’Regan with San Jose and Matt Grzelcyk with Providence. Both teams trail their series, 3-1.